This is a very tasty and slightly tangy chutney with nutty peanut flavors. Both I and my husband love this chutney. It is a great accompaniment to idli and dosa. Tastes good when mixed with plain steamed rice and some ghee. 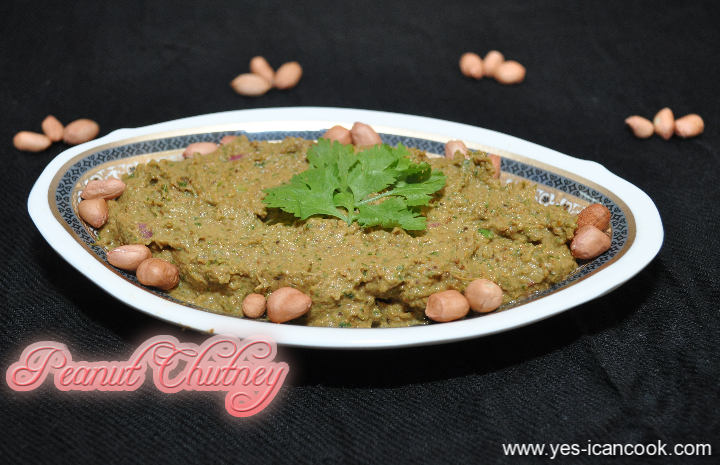 If you like peanuts then you will most definitely enjoy this chutney. It is my mother's recipe and I have been enjoying this since childhood. 1. Dry roast peanuts till they turn golden. 2. When they cool down rub them with your hands to discard skin. 3. Soak tamarind in very little warm water just enough to soak tamarind. Discard seeds and fibre. 4. In a mixer add the peanuts with tamarind and green chillies. 5. Grind with the water in which tamarind was soaking till the peanuts are almost ground. Add water little by little. 6. Add onion, coriander leaves, salt and grind till onions and peanuts are completely ground. You can even leave them a bit coarse. 7. Add water to adjust the chutney consistency.